"I know a leader that has been dancing only 10 months. He likes to walk and do close embrace or traspie. But his steps are straight forward without much figures. Many very experienced followers give him compliments for his dancing which is emotionally passionate. They are taken by his emotionality and the confidence of his lead. Leaders, this first fact will probably bring you no comfort at all, and for that I'm sorry. Followers are different. We all like different things and the perfect embrace for one follower will bring complaints from the next. Tanguera A can't get enough volcadas, Tanguera B hates them. It's frustrating trying to learn and re-learn what followers want. It's true for followers too, if that's any comfort. Some leaders don't feel like they've had a good dance unless the follower really contributes her own voice to the dance. Other leaders consider the slightest adornment to be an interference with his dance. We have only a few songs to listen to each other, learn from each other and adjust. Sometimes it happens and we connect, sometimes it doesn't. What is that the most popular leaders do that women love so much? What did the followers like about their dancing? I did get some consistent answers. First, I tried to determine who the most popular leaders were. Easy enough - I just asked around. A lot. After about 30 followers, I noticed the same few names kept coming up (as well as the same 10 or so characteristics of those leaders' dancing) so I started compiling my list. I emailed the leaders on my list to find out what sort of things they do to please their partners? What advice would they give leaders in pleasing women? I asked them to think about their dance, and what they thought they did that pleased followers most. Here is the advice from a few of the most popular leaders in my community (in no particular order) as well as some pretty sound advice from around the Tango Web community. 1. Don't assume anything. Listen to her body (and be present.) AmpsterTango called it Dialing In. "Whatever she does, I adapt, and dial in my settings for my lead to match her level of follow. That way, regardless of what and how she follows, by dialing in, I can try to make everything flow into that magic called tango." This ties directly with what followers told me they liked. Their favorite leaders are present, in the moment, listening to them and to the music. 2. Wait for her. Take your time/don't rush. This ties quite a bit to the previous advice, but moves forward in the dance, and gets a little more specific. Complete the movement, and make sure she has completed the movement, before moving to the next thing. Relax and be calm, and she will be too. If you rush, you lose her, and lose the connection. "Here comes the secret. Each step has a beginning, a middle, and an end. This means that when you lead your partner to take the first step of the sequence, you have to wait for her to complete the invited action before giving her the next lead. Then, when you lead the second step, the same thing happens. You have to wait for her to get to the end of that movement before going on to the next one. Not that you have to come to a complete stop at the end of each step; you simply have to make a judgment that she’s balanced and ready for the next movement. If you don’t think she’s quite ready, wait." 3. Do less. Keep it simple. If she constantly has to worry about what crazy thing you're going to spring on her next, she won't be able to relax and really connect to you (and to the music.) For an excellent take on the subject, have a look at In Search of Tango's Simple is Beautiful. Although, I think Cacho Dante probably says it most concisely on this page. "The guys at that time had already surpassed the stage of steps. They had already passed through the filter: When they didn't really know how to dance, they did 20 steps; when the knew a bit more, they did 10; and when they really knew what they were doing, they danced five, but with real quality." 4. Dance with your whole body. This was something I hadn't thought about until recently. Leaders are so often told to lead with their chest (or worse with their shoulders) or some other very specific part of their body. While the center of leader's intention may be focused a particular place (and that can be endlessly debated elsewhere), each leader I talked to said he tried to lead from, and with, his whole body. Followers remarked that they felt their favorite leaders leads from their entire body. I don't think that's a fluke. From Beginner's Mind Tango, "Tango may well be soft, gentle, smooth, but the whole body is engaged." 5. Know the music. Listen to the music. Care about the music. Followers can feel it when you don't. There is no shortcut for this. Practice walking and listening to the music by yourself. Pay attention to what the music asks of your body. How do you feel like moving when you listen to it? Johanna Siegmann describes the musicality of the "Magical Lead"
"Without exception, every ML uses the music!!!!! This is the single most important misunderstanding people have about Tango. Improvisation does not mean 'ignore the music'. You must find the soul of the music. If the leader follows the music, the follower has a frame of reference in which she can move as well. They are both working off the same script. When a leader randomly does fast steps, slow steps, complicated steps, and pauses, a woman has no choice but to follow robot style, since she does not have any idea when he might move again. I believe leaders who cannot hear the music are also unable to 'hear' their partner." 6. Be sure of the steps you lead. Women don't particularly care for being practiced on like crash-test dummies at the milonga. Things don't always turn out like you planned, and moves can go wrong for any number of reasons, but keep your experimenting to an absolute minimum during a milonga. During classes and practicas, go for it, practice and experiment like crazy. If you have a regular practice partner, and have agreed that practicing is ok, that's great - don't assume others will agree to that. Some thoughts from Learning Tango, "Firstly, the Golden Rule in social dancing should be: only lead what you know how to lead properly." - and more good advice LearningTango.com. 7. Be gentle. One leader (who wanted to remain anonymous) wrote to me via email, "Contrary to popular tango images and shows, most women don't enjoy being pushed and thrown around like rag dolls. Flashy moves can get you one dance, a gentle dance can get women looking for you as soon as you walk in a milonga. It's a matter of priorities." More advice on the matter from Alberto Gesualdi, via Tango-L, "Be gentle, hear the woman´s body, her breathing, the beating of her heart." 8. Dance for her, not for yourself. Everyone wants to look great, but if you're dancing for your own gratification, she can feel it. In the words of Cacho Dante once again, "Guys, to dance tango, you must listen to the heart of the woman." 9. Check your manners. This goes to a popular post going around Pinterest and Facebook, "If I guy is nice to you, but rude to the waiter, he's not a nice guy." A guy who's a nice dancer, but rude and insensitive to other dancers on the floor, is not a nice dancer. 10. Keep your partner safe. 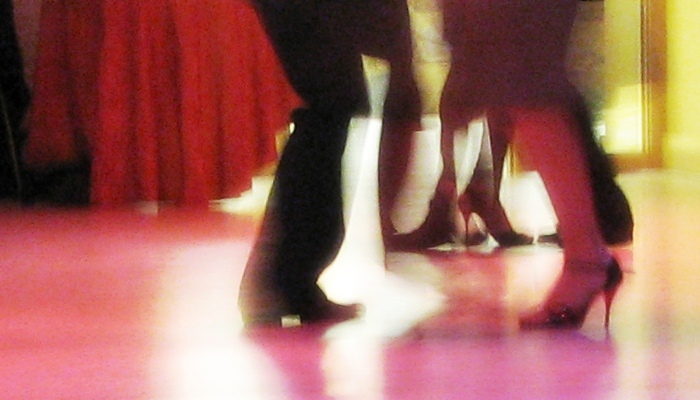 Keeping your follower from getting hurt needs to be your top priority - especially in a chaotic milonga. Here are some great guidelines from TangoCorazon for navigating and keeping your follower out of harm's way. Followers and leaders, what are your thoughts observing your own community of dancers, and your experiences? I love it! Good stuff that bears repeating. And repeating. And repeating (I sometimes feel a very slow learning). It'll be 5 years this spring that I've been dancing tango Argentino. Yet I feel so wet behind the ears. I keep peeling away layers of extraneous stuff, keep learning more about keeping it simple, staying connected, listening to her body, dancing from mine. Thanks. I have a somewhat sideways viewpoint on this that gels with your cute 20 year-old who wants to do ganchos. What comes across to me in all the points is that the leader has to be authentic. One of my favourite tangueras once said to me "Oh, I thought you didn't like milonga?" to which I explained that I'd only just gotten to the point where I could understand milonga music and move in a way to it that I wanted to. I'd always wanted to, I just hadn't been able to before. As a leader I think you have a few choices. First, try and figure out what it is that you really want to do? Does Pugliese make you go :S or :o) Do you deep down want to dance ganchos? The easy answer is to then focus on that and find the women who want to dance that way, whatever that may be. But there is another answer. Try out other things and ask yourself why is it you don't like them? Then go and talk to people who do like them. Check that there aren't hidden reasons. Tango lyrics used to irritate me because I don't speak spanish and I was told that they're all depressing and whiny. But then I went and looked up the translations and there's incredible beauty in them and now I love lyrics. I also reckon every once in a while it's worth checking that the things you don't like, you still don't like. But I'd still stick with dancing with tangueras who can follow you in a way that is authentic to them. Hans - Thank you for your feedback, Hans. We never stop learning this dance. TP - lol, I am actually working on a post from the other side of the embrace, but the answers so far tend to be a little on the snarky side. (I find it's best to ask those questions before the wine starts flowing lol.) And that part of the quote (Gustavo etc etc) wasn't really what I was drawn to - more the first part. But it seemed strange to only have the first part in there. I agree that the authenticity is the key. If you don't know yourself - you can't know your partner. And you have to make peace with the fact that things change - your preferences, others' preferences, your reason for "being here, doing this". Nothing stays the same. That's why I still take lessons in the things I like least because most of the time there is something to be learned - even if it's only, "nope, still hate it." At least I'm not acting on an assumption. Ghost, I don't think I agree on the "authenticity" thing. There are very authentic leaders who just do horrible things which are still authentic. Ghost, but what you wrote about milonga has a lot to offer me. There are only very few leaders with who I dance it, and even with them I don't feel very comfortable. Most of the time I use the milongas for resting and watching, but I'm always a bit sad and feel that I would like to do something about it. I just don't find out what it is. Maybe points No 2, 3, 8 and 10? Loosely speaking in my experience there's two types of leaders. There's the ones who genuinely want to do horrible things and there's the ones who either don't know there's a better option / have been told that the better option is bad in some way / are scared of taking the better option. My feeling is that the one's who genuinely want to do horrible things should go for it. And do them with women who want to do that, ideally in a venue filled with people who all want to do that. And then I can dance with women who want to dance the way Mari's describing in venues filled with people who also want to do that. 2. I don't want to dance sequence 1A three times, then sequence 1B three times and so on. 3. I don't want to step on every single beat (in what would be double-time in tango). One hidden thing about milonga - you can think of it as getting a full body massage to periodically help get rid of the stresses and tensions that gradually accumulate if you only dance tango all night. Cinderella and Ghost - great comments from you both, thank you. I only learned to love milonga when I realized that when things go wrong - there's no time to fix it or worry about it. Just keep going. That took the pressure off for some reason, and then I could really enjoy milongas after that. btw that's one of my very favorite videos, Ghost. Gorgeous. Thank you so much. This kind of effort you have done is extremely valuable, because it is based on statistical patterns and not just personal opinion which some people can easily disregard. All advices are very good, but I have to comment on the second one. Of course not waiting for the follower is very important, and probably very typical mistake many leaders make. But if we go little bit deeper on the subject, if you are dancing in more fluid and circular (I am talking about nuevo), it is necessary that the initial impulse for the for the next direction starts already while the follower is still completing the previous step.